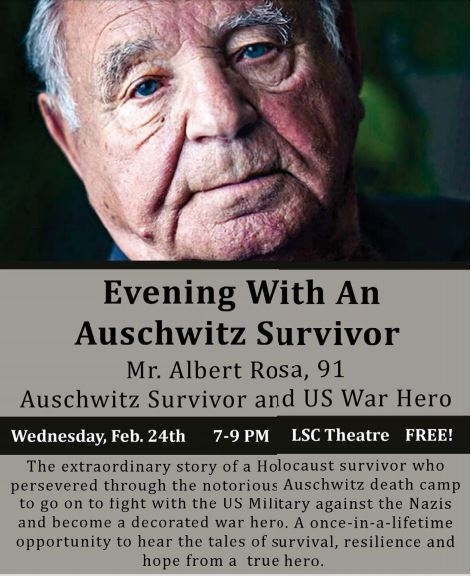 The extraordinary story of a Holocaust survivor (Albert Rosa, 91) who survived the notorious Auschwitz death camp to go on to fight with the US Military against the Nazis and become a decorated war hero including the Purple Heart. A once-in-a-lifetime to hear a tale of survival, resilience and hope from a true hero. family. He excelled at swimming, soccer and boxing. family and many others were crammed into cattle cars. Over the next 10 days, they were transported to Auschwitz. fighting the Nazis and eventually became a Nazi hunter. did not talk about the atrocities he endured during the Holocaust. from a true hero, a giant among men.